What Mindless Tasks Do You Automate on Your Computer? Even though technology makes things much easier for us, that doesn’t stop us from wanting things even easier. For this reason some of us look towards automating some of the tasks that we seem to be doing repeatedly. It’s the whole basis behind IFTTT. For that reason, we asked some of our writers what mindless tasks they automate on their computers or mobiles to make things easier for them, whether it’s with IFTTT or through a different process. Trevor uses IFTTT to move tagged articles in Feedly to various Trello boards and columns. He also uses it with Craigslist to have it scan for items or freelance work. Outside of IFTTT, he uses DropSync for Android to sync his download folder and images with Dropbox. Derrik has IFTTT set up so that every time he changes his profile picture on Facebook, it will automatically do the same to his Twitter profile. He also scans RSS feeds for keywords and searches Reddit for news articles and tweets them with an account so that he can see them better. Additionally, he has written a few bash scripts to automate Linux tasks such as updating and networking stuff. Charnita has her mobile pictures uploaded to two different cloud services so that she can delete them off her mobiles. She’s been using IFTTT since it first started so has many “recipes.” One unique thing she uses it for is WiFi-enabled buttons such as one that sends a notification letting her and her husband know when their dog was let outside so that the other will know it’s been taken care of. She also has Amazon Dash buttons to automatically order toilet paper and trash bags. Jeffry leaves all the post processing of his screenshots to Hazel by saving the images with certain tags. Hazel will move them into the correct folder and resize and optimize them. He just needed to set the rules once, and now his screenshots are always ready for him. He also uses IFTTT to add articles to Evernote with certain tags to make into a writing list. Similarly, although I just started using IFTTT, I have a recipe that sends every news article I’ve saved to Pocket into an Evernote list. I also have some news sources send their articles directly to Pocket and others directly to my email. So far IFTTT doesn’t support Inbox, but I’m waiting for that so that I can send some of my emails directly to Evernote without having to have a paid subscription. I also have a receipts app that I use that automates much of that process for me. It allows me to scan in the receipts and automatically grabs all the info from it. I can also forward emailed receipts to it, and it will add them that way. And the app automatically backs up all the receipts to Evernote. 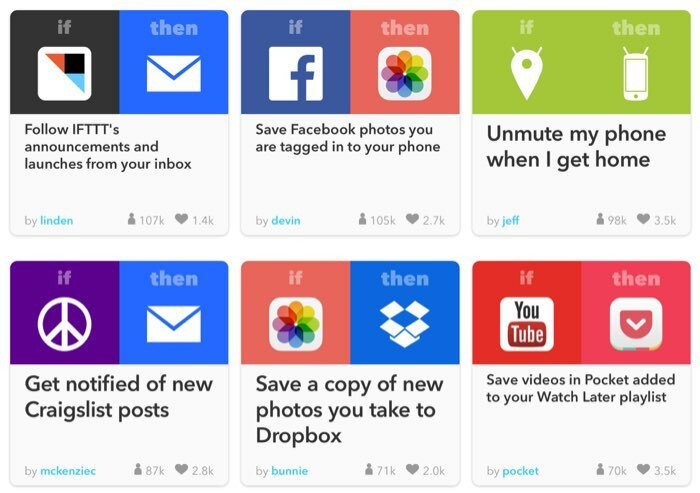 We’re sure that you probably have some interesting IFTTT recipes or otherwise automated tasks as well. Aren’t we all looking to make things a little easier? What mindless tasks do you automate on your computer or mobile? Let us know in the comments below.